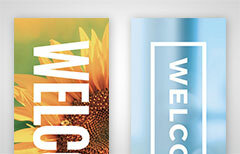 Indoor banners create an inviting environment for church visitors. 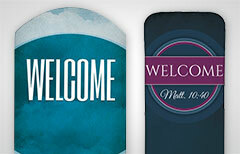 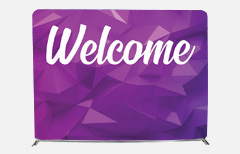 Use indoor church banners for decoration, direction, or to welcome people to your church! 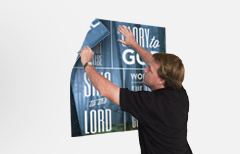 We have church banners for all your indoor needs, including vinyl and fabric banners, roll up retractable banners, fabric tension sleeve banners, jumbo backdrop banners, table covers, window clings, and more. 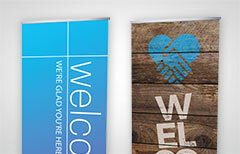 Choose one of our stock designs or let us create or print a custom indoor banner that's unique for your church. 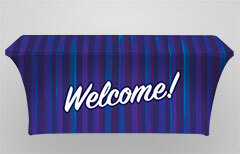 Jumbo Banners 9'7" x 7'2"
Want a completely custom indoor banner?